The guys talk about Mike Stackpole's new book, At the Queen's Command, an alternate history fantasy around the Revolutionary War. This is the first in a new series, brought to you from Night Shade Books, and you can also read the first three chapters over at http://www.stormwolf.com. At the end of the show, they also chat about some of the new developments coming out of Apple's announcements of the new OS X, and opening up of where and what platforms apps can be used. 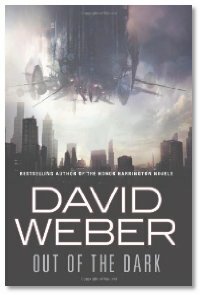 Interview: Mike and Mike talk with David Weber about his newest novel, Out of the Dark. It follows the consequences of an alien invasion gone wrong after Earth had been targeted for colonization, and is the first in a new military series. This story is an expansion of a novella that appeared in the recent Warriors anthology, edited by George R. R. Martin. Also in the works is a young adult "Honor Harrington" story, and David also talks about the differences in expanding a novella into an adult novel and expanding one into a young adult novel. The idea of writing an app to do one job and do it well is the primary philosophy of Unix and derivatives which include Mac OS X and Linux. So Apple deserve little credit for an idea that's been about for forty years. Low cost software as well as free software has been about from the inception of computing unfortunately some people think that free software is inferior necessarily to proprietary software and buy overpriced Apple, Microsoft et al. This is also true of fashion hardware where we would do well to remember that all that glistens is not gold. Apple, like Microsoft are in it for the money, period, FULL STOP.